The emotional effect of music depends largely upon the type of rhythm that it employs. Rhythm means flow: a movement that surges and recedes in intensity. The flow of rhythm assumes many forms in music. Much of the color and personality of music comes from its rhythm. This may be the contrast of strong and weak impulses, long and short note values, low and high pitch, slow or fast, even or uneven, with accents frequent or infrequent. Combinations of these elements give rhythm its character. In addition to musical performance, rhythmic timing is also applicable to:music/words/phrases depends upon sensation and memory; for we must not only feel sounds at the instant they strike the instrument, but remember those that had been struck before, in order to be able to compare them together. The time element separating consecutive tones is the organizing factor in hearing, feeling, and comprehending the intent of music or spoken words/phrases. The rhythm of the human being is mostly related to the heart pulse. Rhythm has an effect on the heart, and is measured against it as well. We have a clock built into us—the pulse—whose normal rate is about 72 beats per minute. [See also the relationship between the number 72 and buk-nunu earler in the text.] It is by this yardstick that we judge rapid or slow events—their tempo. When the musical tempo varies from the heart pulse (faster or slower), then it will cause unnatural excitement. 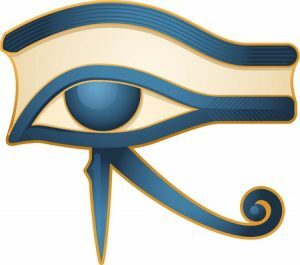 The numbers 2 and 3 are the numbers of Isis and Osiris, the regulators of the entire universe, as shown earlier. As such, practically all rhythmic organization is based on one of two general schemes: the binary—strong, alternating with a weak beat, or ternary—strong, followed by two weak beats. One or the other of these types underlies the rhythmic framework of every composition. The underlying binary or ternary rhythm is known as the fundamental rhythm. Subdivisions of these beats that appear within the general framework are called the subsidiary rhythm. The numbers 2 and 3 are related to the natural breathing rhythm and therefore are reflected into the binary and ternary method of time measurement in musical performance. When a person is in a quiet sleep, the time between expiration and inhalation is twice as long as that between inhalation and exhalation. It is the idea behind all musical forms. The in-and-out and the alternation of tension and relaxation, governs all further manifestations. 1. Musicians learn to keep time with the aid of onomatopoeic syllables—quietly. The correspondence between syllables and musical notes makes this method of time-keeping very natural. Singing to/with music follows the same pattern, and can be accomplished in two ways: 1) by using certain syllables for the duration of the note, and/or for time in between notes; 2) or an even or alternate recurrence of numbers, by counting to oneself. Usually, two sizes of syllables are utilized: short and long – i.e. a long/longer vowel, at a ratio of 2:1. These two basic elements are used in numerous variations for variable meters—the sequence of beats and rests contained in each time segment. 2. 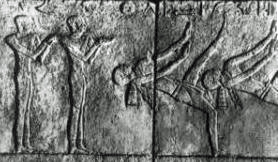 Foot beating is depicted in Ancient Egyptian musical scenes[shown in far right below] as a method of keeping time. 3. 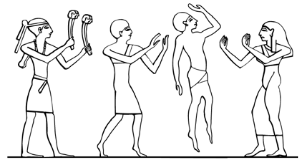 In many musical representations in Ancient Egyptian buildings, musicians are accompanied by a person clapping, or using clappers, to keep the musicians in time. 4. 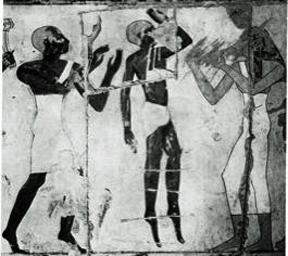 The Egyptians utilized/utilize the drum patterns of small hand drums, the goblet drum (tabla/darabukkah), the frame drum (riqq or tar), or the pair of kettle drums (naqqarat) to regulate the time. 5. 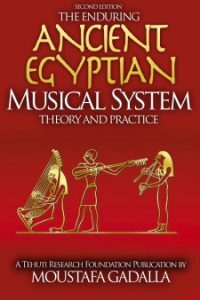 Classical Egyptian practices had two kinds of beats working in combination: silent and audible. 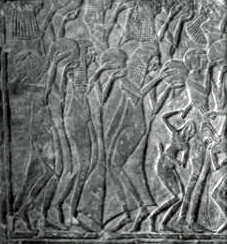 • Silent gestures were used in Ancient Egypt, in various ways by giving signals, such as: lifting the forearm, turning the palm either up or down, and stretching or doubling up the fingers; one hand held partly out with thumb and forefinger forming a circle and other fingers held stiffly, while the other hand is placed on the ear or on the knee in a relaxed position, with the palm upward or downward. The thumb may be up, or bent against the forefinger. In performing these movements, the hands alternated from member to member with the right hand; the left hand; and both hands. The fingers, too, alternated. In duple time, the four parts of a period were denoted by pointing first with the small finger and successively adding the ring finger, the middle finger, and the index finger. • Audible beats were also provided by snapping the fingers; slapping (as the thigh) with the right hand or with the left hand; or slapping with both hands. 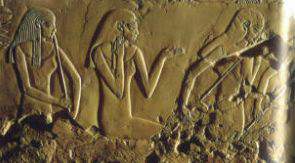 In the tomb of Amenemhet at Luxor (Thebes), dated ca. 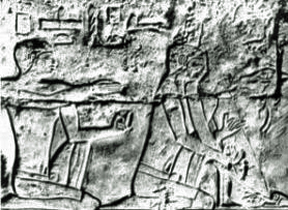 1500 BCE, there is depicted a conductor standing before and facing the performers, pounding time with her right heel and snapping both her thumbs and forefingers.